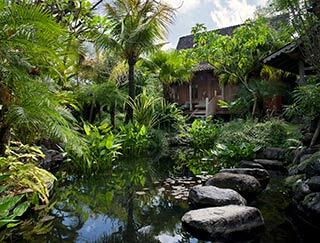 Villa Radha’s Balinese entrance opens to a enchanting garden where large river rocks form stepping stones across the lily pond to a raised century-old Javanese teak wood gladak house fronted by a wide,furnished veranda. (There’s another entrance for those who don’t want to skip the light fandango over the pond.) 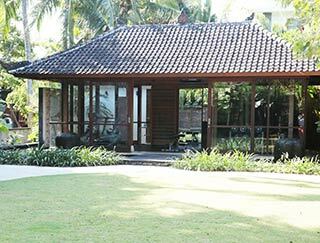 Inside is a large teakwood-clad bedroom complete with sitting area. Doors lead to a small kitchenette on one side and a wardrobe and dressing area on the other; both the kitchenette and dressing room open onto a tropical garden bathroom. Across the pond is a second and much smaller gladak which serves as a reading or breakfast room, while across the swimming pool a relaxation balé beckons. 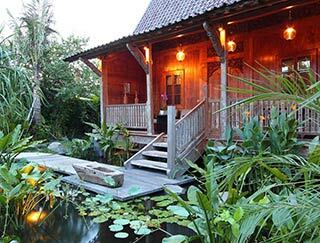 Villa Radha is rustic romance personified – a jungle hideaway surrounded by lotus ponds in a dreamlike world of its own. Inside this traditional teak wood building is a beautifully proportioned bedroom with regal king-size bed and an eclectic collection of chairs. Contrasting with the building’s 100-year history and whimsical furnishings and artefacts are some 21st century features: an upholstered daybed, a 47-inch TV with satellite channels and DVD player, an iPod dock and air-conditioning. 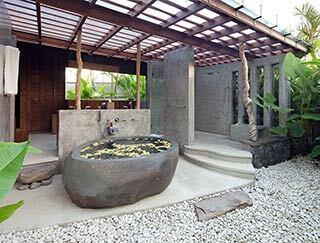 A few steps lead down from the bedroom to an indoor-outdoor bathroom. This space has a more contemporary feel, with polished concrete walls, non-slip floors and a glazed pergola roof. There’s a dressing area, a vanity with twin basins, a walk-in rain shower and a magnificent two-person alfresco bathtub carved out of a single piece of river rock.